Do you need help with your carpet? Does it look worn or have bumps popping up everywhere? If so, Flooring n Beyond might have just what you need. Our carpet repair services are the best in Miamisburg, OH. We can stretch your old carpet out and tuck it back into place. Our team has plenty of experience and knows what it takes to get the job done. We have been saving carpets in Dayton, Beavercreek, Centerville, Springboro and Miamisburg for years. By choosing our carpet repair service, you can save money my extending the life of your carpet a few more years. Then when there is no more hope, we can remove your old carpet and install something new for you. But until then, we are here to keep your floors looking good. 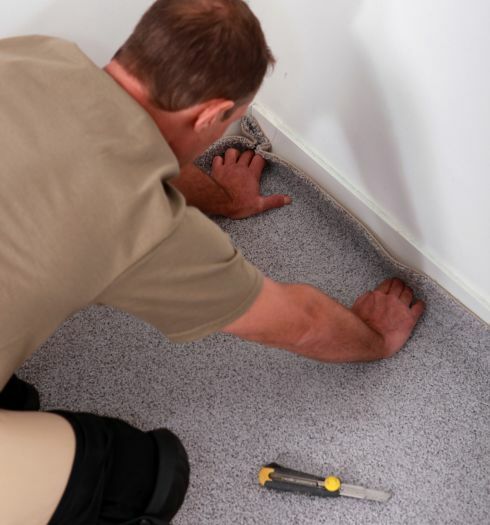 If your carpet needs any of these repairs, chances are you’ve had your carpet for some time. After evidence of wear and tear appear, you better get a professional to look at your floor. Leaving your carpet alone with these issues won’t win you house of the year award – and you won’t want to entertain friends as much either. Dirt and grit can build up, staining your carpet. Places of heavy foot traffic could see signs of wear quicker, which will need to be addressed. Moving furniture on your carpet can also leave a lasting impression. Luck for you, Flooring n Beyond is here to help. Whether it is a tear, lump or stain, we can work our magic. A tear can happen many different ways – your pet may dig at the carpet pulling the fibers loose. A piece of furniture could tear the carpet if dragged across the floor. Lumps need to be stretched out and reshaped to make the carpet even. If untreated these lumps can be tripping hazards as well as turn into tears. Every carpet has seen its share of stains – whether it be from pets, kids or a glass of wine. If the spill is not treated immediately, chances are your carpet will get stained. If you call the pros at Flooring n Beyond, we either do a deep clean on the carpet or our last resort is patching the piece of stained carpet. Our services don’t just focus on residential carpet, as we will also touch up your commercial carpet too. With the high cost of quality carpeting, it is only logical to pay a relatively small amount to fix minor damage. If you really like your current carpet and just it touched up, call the best team around at (937) 866-4755. Residents in Dayton, Beavercreek, Centerville, Springboro, and Miamisburg have probably heard of us, but if you are in need of our repair services don’t be a stranger.